Looking for tours from Edinburgh ? How about taking a tour from Edinburgh of Outlander’s Midhope Castle , Lallybroch in the TV series – just one of Scotland’s amazing Outlander castle film locations ? On this tour we visit Lallybroch ( Midhope Castle ) , ancestral home of Jamie Fraser , Linlithgow Palace ( Wentworth Prison ) and Blackness Castle ( Fort William ) . 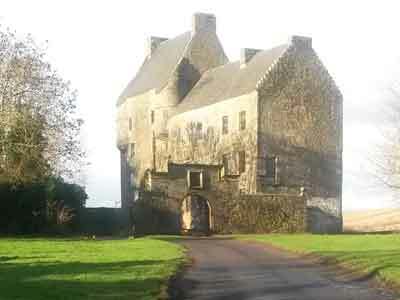 Midhope Castle is a 16th-century tower house of five storeys and a garret, to which has been added a later and lower wing. Midhope Castle tours can be booked on 07305-294773, toll free number 1-866-233-2644 or online . Two-storey bartizans crown three of the corners, although their conical roofs have gone, a caphouse for the stair crowning the fourth. The roof is steeply pitched. The tower forms one side of a courtyard, and there is a fine walled garden and a 17th-century lectern doocot . Tours start at 10 am . Our private group tours take up to four people to three Outlander castle filming locations. We also offer bespoke private tours with the option of choosing your own itinerary . This tour costs £150 . Midhope Castle tours can be booked on toll free number 1-866-233-2644 or online . Midhope Castle tours can be booked on 07305-294773 , toll free number 1-866-233-2644 or online .